Well if the first week of the new president’s administration is any indication, the next four years are going to be beyond craptacular. I enforced a media blackout on myself yesterday because I couldn’t take anymore. And then when I was listening to the news this morning and NPR had a story about all the immigrants and refugees (with visas and papers!) who are now in limbo, some of them already at US airports, I burst into tears. And in spite of the sun finally shining after a week of gray skies, I still feel like the clouds are over my head. I know y’all don’t come here for politics, and I know and expect not everyone agrees with mine, but I can’t pretend everything is hunky-dory. I respect that everyone has different opinions and life experiences and ideas about how to reach certain goals and even different ideas about what those goals should be. Just like it would be boring if we all liked the same books, it would be boring if we all agreed about everything. So I am totally ok if you only show up for the books and skip posts that are about other things. I am ok too if you want to respectfully disagree. I am conflict-averse, I want nothing more than everyone to get along, and in the past have kept my thoughts to myself. But I can’t do that anymore even if you might wish for me to. We are all human and none of us is perfect. I don’t know everything and neither do you. Life is a journey and I aim to learn and grow and be the best person I can. That means I sometimes might be an ignorant twerp about something. Know that it is not intentional and feel free to —kindly! — enlighten me. So there you have it. I hope we can all still be friends. I will be sad if we can’t, but I will also try to understand. An effed up week. It is so effed that I am having a hard time getting my head around it. Where do I start? What can I do? I feel like I am running around from fire to fire and spitting on it which is utterly ineffective. I saw a tweet by sci-fi and fantasy author Elizabeth Bear in which she said (in essence) that we as individuals can’t dedicate ourselves to all the issues, that the best thing we can do is to choose one or two and focus on that otherwise we will be ineffective and in danger of damaging both physical and mental health. It strikes me as true after a week of frantic petition signing, tweets and Facebook comments to my city’s mayor, my representatives, and even the president himself (I tweeted Trump about the #FuckingWall and no, he did not respond but I hope to someday have the honor of him blocking my account. How can I tell if he does?). Because I am only one person and have a full time job and limited time and cash, I can’t run around spitting on all the fires as much as I might want to. So I have been thinking about that Elizabeth Bear tweet. Where do I want to focus my energy? The environment, especially climate change, food, water and land use issues. Surprised? Didn’t think so. This does not mean I don’t pay any attention to immigrants or black lives or women’s rights and other important social justice issues, only that I will do for those issues what I can, when I can. The thing about my chosen focus though is that in many ways it encompasses pretty much every social justice issue out there, not all of them, but a big chunk of them. Many years ago when I began gardening I saw it as a hobby, a fun thing to do with the bonus of fresh tomatoes and the sweetness of just picked, perfectly ripe strawberries. But it has become more than that. Gardening has become a radical act. Digging up my lawn, growing my own food, saving seeds, improving my soil, growing perennials and other plants for pollinators (my garden is a bee, butterfly and dragonfly sanctuary), and always looking for and learning new ways of caring for my little plot of land. I still bring a lot of resources in from outside, but I am getting better at needing less. I think my urban yard is too small for it to ever be 100% self-sustaining, but more and more I am finding ways to obtain the inputs I need from local sources. And it isn’t just about my own garden. The Hiawatha Food Forest proposal to create a food forest available to all instead of a polluting, resource gobbling public golf course is making good headway. It has obtained some small part of the golf course on which to begin planting a fruit and nut orchard. Planting is slated to take place on Arbor Day, April 28th, and I will be there! I also recently learned that the Longfellow neighborhood, practically next door to my Nokomis neighborhood, is a transition neighborhood. Of course their gardening meetings happen on Saturdays which are my cycling endurance training days, but I am trying to figure out ways I might be able to attend meetings and make a contribution there. They even have trainings to help people start their own transition groups. As an introvert and someone who is shy with strangers, the idea of trying to organize a transition group in my own neighborhood is terrifying, but I believe it needs to be done so it might, eventually, have to be me. But I am doing all sorts of terrifying things these days it seems. Will it ever get easier and less scary? To help my spirits today I began doing newspaper pot origami. Seed starting begins in three weeks so it is time to get ready. That reminds me, I need to order the grow lights I found at the home improvement store. 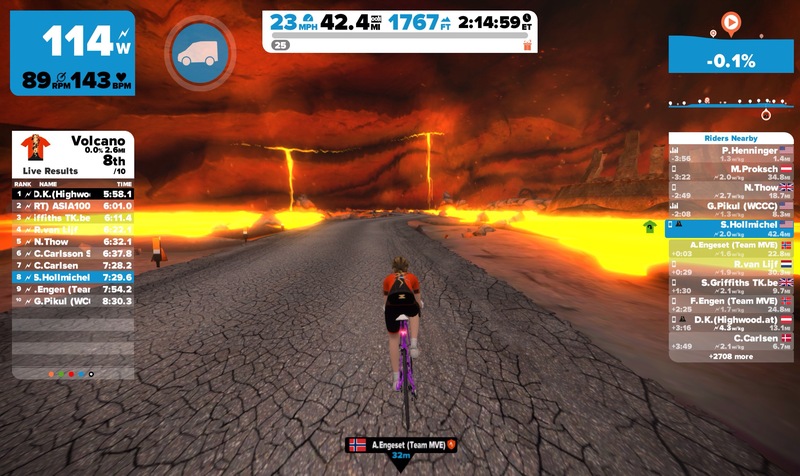 In my cycling life, Zwift opened a new course this week that makes riding on a trainer less dull. This new course goes through a volcano! The course is a circuit and has a lap counter, perfect for criterium racing. And, when you have the fastest lap time, you get to wear an awesome volcano jersey for an hour or until someone else beats your time. I got to wear it for a little while yesterday. All this work on the trainer will, I hope, pay off come August 5th. What is so special about that day you ask? Well, check it out: Minnesota RAAM Challenge. Yes, yes that is my name there as a women’s solo rider for the 200 mile race. Am I crazy? Probably. But I am also pretty sure this is something I can do. I rode 114 miles/183 km in six hours on my trainer yesterday so I am over halfway there. I know trainer miles do not equal actual road miles, but I train harder with speed and elevation so when I get on the road it will hopefully even out. It is still cold and icy on the outdoor roads and I don’t expect to venture outside on a bicycle until the end of March, but that will be here before I know it! Because the internet was apparently built for cats, and who doesn’t love a cute cat photo? 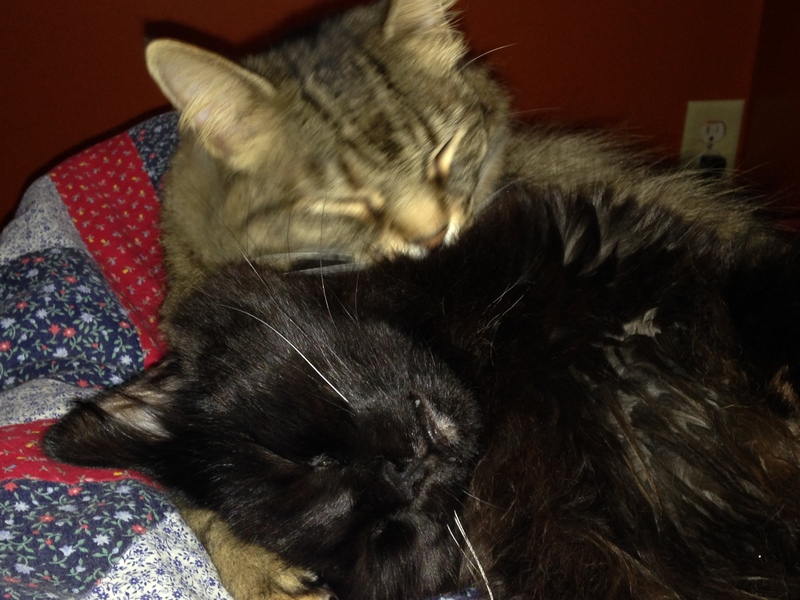 Here is Waldo giving a blissful Dickens a bath. Be safe out there and don’t forget to practice kindness on yourself and others. I agree. I am very concerned about the direction that the new administration is going to move. It is very alarming. I think you are wise to exercise your freedom by gardening and living a life that you love. I hope this week will be better for you! And I absolutely love your kitty pic! Alana, glad you enjoyed the kitty pic! I am working on getting over feeling guilty about not being able to do everything but I think once I am further engaged I’ll begin to feel better. I hope! It has been an even more depressing and shocking week than I had anticipated, he’s well on the way to being a dictator – a tremendous one – tremendous! That transition thing is interesting and it will definitely help your mental health, as will your cycling. One good thing is that as we get older the years fly by so fast, those four years had better zoom in. pinfing, oh you made me laugh! thanks for that! 😀 Transition is really interesting and it was started by someone in the UK where you have a whole bunch of transition communities. Heh, I suppose that is one good thing about getting older! I am almost scared to check out the news because I can’t imagine anything worse than has already happened and yet every day brings more crappy news from the white House. I really appreciate you talking about this and I totally understand what you mean about having to find some focus. I, too, have been signing petitions left and right and I feel like I don’t know what to do anymore and it’s just so sad. I think you have some wonderful outlets like your gardening and cycling to help you get through all of this. I know I’ll be focusing my energies also on taking care of my creative self! Thank you Iliana! If only there was a way we could do everything. But there is just so gosh darn much. Do take care of your creative self! I know what you mean about being overwhelmed with things to care about. I saw someone this week tweet that same advice about choosing one or two issues, and I really like that. For me, the issue I’m thinking about is equality, both in terms of race and immigrants’ rights. Even with that focus, there were three separate protests in my area I could have gone to today–a benefit of living in the DC area, I guess. I chose the one closest to me and of shortest duration, knowing that last week’s 14-hour protest wiped me out. So I spent an hour outside Richard Spencer’s alt-right headquarters with fellow citizens chanting and singing about equality and love. Teresa, a wealth of protest choice in the DC area! Thank you for attending the one you did. Apparently a good many of the protesters in my area prefer to do things during weekday business hours to better disrupt things, which I totally understand but it makes it really hard for me to take time to attend. Hopefully once I start casting about I will find some things I can do! Thank you for the cat photos! I’ve been focusing on one issue and getting involved in local politics. I was surprised to find out, just this week, that groups I consider extremists, like so-called “pro-life” and NRA groups, have been getting regular meetings with congressmen in my area. Well, now my group has one meeting set up, and plans to continue paying attention to what our representative (the first up for re-election) actually does each week. Jeanne, cats are good at making a person feel a little better aren’t they? Ooh, you go! I think we forget about local politics too often when it is the local that truly affects the outcomes of bigger issues. Plus in many ways it has more of a direct impact on people. I wish you and your group all the best! I’m with you. This has been a HARD week. I’ve had to impose media blackouts on myself, as well. It gets to be too much. But I agree that focusing on the one or two issues you care most about and doing whatever you can to fight back in those areas is the way to go. At the very least, know that you are not alone! I agree… I can’t pretend that things are okay and continue blogging like a regularly scheduled program. I’m not posting to my blog because I don’t want to add to the virtual weight of all these conversations (because let’s be honest, there are people who express how I’m feeling much more smoothly and succinctly than I could right now), but it’s all I feel is important right now. But I guess a good move is to make resistance a part of our lives. Angela Davis (http://www.elle.com/culture/career-politics/a42337/angela-davis-womens-march-speech-full-transcript/) said a few powerful words that I’m still pondering, and I think what you’ve already done as far as calling, tweeting, resisting is a strong effort. Focusing your efforts is a good idea. If you focus on battling ignorance about climate change and helping the environment, I will focus on immigrant rights and someone will focus on women’s rights, etc. and then we are all together focusing on human rights. “It’s gonna be great.” We can do this! You’re right. It’s been an incredibly hard week but hopeful in that people are so fast to get organised and react. It is, I think, necessary to keep talking just to remind ourselves that there is sanity in the world and to help each other find ways of resisting and of dealing with it on a day to day basis. Local action is a great way to go, and I do mean our own back yards. Here in the UK we have all your news plus this is the week parliament debates about the EU. That’s a whole big other ball of stress only, in this case, the government is proposing to strip its own citizens of existing rights and to dig a massive hole under the economy, on purpose. But without telling any of us the details in advance. It’s a horrible mess. Trump will probably implode at some time but the damage he is doing to the idea of American democracy is almost incalculable. Your great country seems as divided as at any time since the 1860s! It is not much better here. The right wing press is clearly trying to “normalise” this president as is Theresa May with all the tired bull about the US/UK “special relationship”. Ian, maybe he will, but as you say the damage he is doing is terrible. I hope we aren’t as divided as the 1860s and civil war! But yes, there are deep divisions and the government is doing nothing to try and fix them and only seems to be driving in a wedge. Oh yes, we’re getting the “special relationship” thing over here too. I grumbled over the chummy meeting the two had. I cheered Enrique Pena Nieto’s decision to cancel his meeting with Trump. Trudeau in Canada has been quiet, but then nobody has been picking a fight there yet. No, maybe not… I certainly don’t think our PM is feeling very special at the moment, and I don’t feel very sorry for him because that whole deal was very bizarre in the first place. WE should be sorting this out, not trying to pass the buck. Maggie, yes, let’s be sure to keep talking so no one feels alone! I cringe every time I hear something about Brexit. I just can’t imagine how it could possibly go well and not end up hurting most people in some way. My heart goes out to you and I hope for the best possible outcome! I totally know the feeling of wanting to stick one’s head in the sand to wait it out… I’m so glad we don’t watch tv as we don’t get inundated by sad news, it’s still bad enough with internet and radio and newspapers. Practicing kindness everyday is a great reminder. At least with internet we know that we’re not alone! smithereens, I don’t have a TV either and am glad for it! But still I am inundated with news. You are right though, at least with the internet we know we are not alone! And kindness always goes a long way I think. Not getting too much into politics (I don’t agree with some of your views) so far, this President seems to be keeping his campaign promises. These are the ideas that got him elected, so I am not at all taken by surprise by any of them. But you are so right in the importance of picking one’s battles. The world is never going to march in lockstep on every issue. As you said, this diversity assures we will never be bored. I share your belief that we must do whatever we can to protect our Mother Earth. Even the small things you are doing with your own garden make some positive difference. Perhaps not globally, but certainly a difference in your own personal earth-space. Stef, I went away to the mountains this week. Alone, because I live alone and because I wanted to be alone. It forced me to do things I am reluctant to do because I too am shy and an introvert. I walked into a pottery studio and found the potter, Brad Walker, to be Zen-like figure who engaged me in conversation about all sorts of things, particularly Buddhism, incense, finding peace, and the benefits of a good cup of coffee. I left with two pieces of pottery I purchased and two books he gave me as a gift (to help me on my journey, he said) both by Thich Nhat Hanh. After an hour, I left feeling as though we’d known each other forever. Next I visited a vineyard and chatted up the owner, a single woman who at age 60 who had dreamed all her life of owning a vineyard…and she made it happen. She took a leap of faith in herself even though she knew nothing about the industry. But she learned. We talked for another hour about our shared experiences, including being caregivers for an elderly parent, the stress that puts on one and how alone it can make one feel…as though the weight of the world is balanced on a pair of already fragile shoulders. When I left, we promised to stay in touch. I believe we will. But the biggest move for me was buying a ticket to a concert in a very small cafe venue. I was going to have to share a table with a stranger. When I walked in that evening I saw my table-mate was already in place. A man about the age of 45. I introduced myself and asked him questions. Turns out he has a shelter for chimps rescued from laboratories. He was proud that he is expecting to accommodate 200 more within the next month. He is doing something he loves and believes in. He also knew a lot about the band (The Bottle Rockets) and educated me about them. I came away from the weekend reinforced in my belief that the world is a noisy, chaotic place. And there is plenty of humanitarian work to be done. But also that individual people make up that world. Most of them are good people. They may not agree on how we vet refugees, or open borders, or abortion, or states rights, or legal marijuana. But most of them are good people. And I have vowed to fight all my shyness. So, get out there and organize that transition group. They will be lucky to know you. I, too, am concerned about the direction of our country. And deeply saddened, not only by the policies, but by people’s animosity. I agree with your commitment to the environment–even though there are other important issues, this one affects everyone and not only in this generation. Jenclair, it’s hard right now and on the national stage people just seem to be shouting at one another. You are right, environment affects everyone and there are plenty of local opportunities to be involved with instead of the distant and abstract. And there are so many pieces to it I feel like it is the ultimate global social justice issue in some ways. I am feeling so many of the same things. I find myself in tears listening to the news on the way to work every day. Thank you for reminding us that we can all do something–not everything, but something–to make things better. Melanie, and thank you! Let’s keep talking and supporting one another. No one should feel alone and helpless! I tried to comment on your last post but it didn’t save? 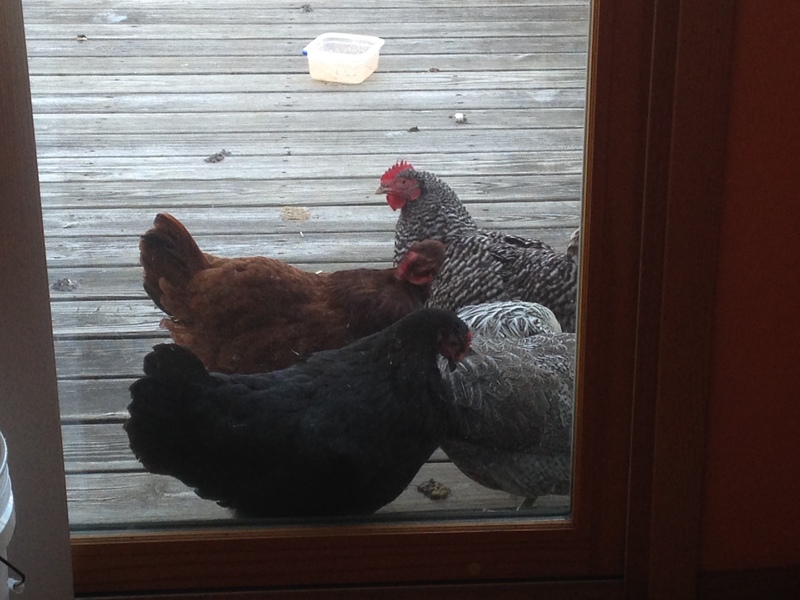 Meant to ask why one of your chickens has a very short comb- will it grow out like the others’? just curious. I’m in process of reworking my coldframe to make it useable for spring! Jeane, I am certain you aren’t a coward. Sometimes the bravest thing is taking care of yourself. Protest crowds can be scary, maybe your place in resistance is making phone calls or doing something else? We all have to find our way. As for Marianne’s comb, I think that is as big as it is going to get which is kind of funny because we worried a little when she was still young that she might be a rooster! You have a coldframe? Call me envious! I’ve made several, in the past. This is the best one yet, but it still needs to be improved. Can’t get what I wanted here in the states, so I made one from scrap. The build is here, here and here (in that order). Past ones have been a lot more simple… Cheers! Oh, that came out nice! And I like that you made it from scarp, very economical. Ah, you are expressing what so many of us are feeling at the moment – and I’m not even American, merely watching from afar (although, as a Brit, there are worries enough here as well). I wrote about this sense of powerlessness and fatigue as well, and the impact it is having on my sanity and creativity. Wishing you all the best. MarinaSofia, it is good to know we are not alone in how we feel. I am trying to keep up with Brexit but it gets overshadowed by all the stuff going one here. Still I worry about the US, the UK, about Marie Le Pen in France. All the best to you too! Do what you can, whenever you can. I also feel like I cannot do enough to actually make a difference, but at least I try when I can. Isabella, kind and wise words. Thank you! OMG. I hear you. Each morning that I wake up, I wonder what has happened (or will happen) with this new administration. I think the best advice would be to do what you are already doing: make a difference within your own sphere of influence and educate, educate, educate. (Oh, and send postcards and telephone your reps. A good website to help with this is 5calls.org.) Hang in there. America is better than this, and the good will come through in the end. Oh Liz, thank you for the 5 calls link! I’ve been meaning to start making calls but I get hung up on what to say and they have helpful little scripts! Very cool! yes, I am starting to think the best way to go about things is to work locally. the Tea party movement has shown how immensely effective that can be. I may disagree wit their goals but that doesn’t mean I can’t borrow from their tactics 🙂 Thanks for such an encouraging comment! I agree wholeheartedly with you! It really is very overwhelming and I think in order not to go totally crazy by everything that is on the news (and Twitter and FB and in the newspapers and on magazines….) you have to allow yourself time to look at cute cat pictures and let your face glaze over while you watch the Bachelor (or some other total nonsense) and enjoy a book that is pure escapist. And yes, there is way too much to try and deal with–gardens and all things related are totally a natural for you and I look forward to hearing all about them in the coming months (let’s try and take it slowly right…). I am trying to keep it as much bookish as I can, but it would be impossible to ignore it all. Happy vibes coming your way! Jenny, it makes me feel better too, like we have each other’s backs, you know? So glad you are on the voting rights issue, I think it’s one that gets neglected especially since it impacts the more vulnerable people the most and the only time anyone not directly affected pays attention is around election time and then it is too late. Okay, here is something weird. You were in my dream last night (I don’t know what you look like, so you had no face). I forgot to take the medication I usually take before I go to bed and I was very distraught over the mosque shooting here in Canada so that’s probably why I had this bad dream. But in it I had chickens and a plastic shed they lived in and I was introducing them to you. I let them out, but the yard was fenced with ordinary barbed wire. So they got out into an open field and were attacked by a wild dog or coyote. When I woke up I was frantically trying to dig a chicken out of the snow but it was dead. Not sure what that all means. This has been a distressing week/weekend. My American friends and family are in my thoughts (and I am US born myself). The mosque shooting was horrible. I am glad they caught the man who did it and I am glad it is being called a terrorist act. My heart goes out to everyone there. And thanks for keeping the US in you thoughts, we need all the positive vibes we can get right now! With you on all of this and am so comforted by the engagement here now that you’ve decided to focus more on these issues (at least in this post), by the responses from so many others who are each trying to make change each day, in different ways. Like you, I took a day “off” and then missed the announcement for another protest which I would have wanted to attend because so many other people cannot take action on a Monday morning but, right now, I can; I felt awful, but am also consoled by the fact that it was successful nonetheless (without me! *laughs at self-importance*). So, the US consulate was shut down for the day and the protesters halted traffic (while drivers waited patiently, some in open support) and later made a thick human wall so that the Muslims in attendance could kneel to pray on the protest signs when the event went later than planned, while I wasn’t there. Keep on, keeping on! You’re doing great! buried, oh what a great protest! Too bad you didn’t make it but definitely don’t feel guilty about it, we all need to take time to rest and recharge otherwise we will quickly run out of having anything to give. You are right, we have been privileged to not have to figure all this out until now but it is heartening to know there are so many who are trying to figure it out and it is great that in the process we are also able to support one another. Good feels all around! And thank you for all that you are doing! I appreciate you. I learn a lot from you and admire you greatly. If I sent you some tomato seeds that I saved from last year, would they be useful and would it be a good idea? Like you I’m conflict averse and do very little politics on social media, though do occasionally. I’m very happy for you to do it here. I have a Californian friend with whom I snail mail pretty much weekly. We laugh about the fact that we always store about the weather, eg “oh, I’ve nearly got to the end and haven’t mentioned the weather, so here it is…” Etc. Well, for the last few months another topic has crept in which may be talked about every week, yes, Trump. She, like you, is almost apoplectic. As for climate change, I agree. Each year an activist organisation sends out an email survey asking for input re where to put their efforts, and they ask us to prioritise. I always put climate change first for the reason you give. It underpins everything. It seems to me to be a rare situation where the priority answer is a no-brainer, except of course, we do need people also working for refugees and the whole gamut of disadvantaged situations, other environmental issues, etc, so I’m glad they don’t have just one priority. Oh the typos, despite my attempts to catch them… “talk about” not “store…”, and “must be” not “may…” Grrr. whisperinggums, LOL, you should stop reading your comments after you push the post button! 😉 You and your CA friend are a hoot! It’s hard because there are so many important issues that need to be addressed and it is just too much for one person. I like that so many are choosing such a variety of issues, it makes me feel better. I wish and hope that the various groups come together and collaborate when and where they can so everyone can see and learn how so much is intertwined. I know what you mean by blocking out the media…we have a worse version of Trump here and I cannot believe how many sane rational people seem to side with things which are go against every humanitarian principle that is there! Anyhow, i think gardening and growing your own food is very radical. It may not be the thing here as our farmers are poor and many can barely etch out a living but I agree with your stance completely!! All the best with your races…you rock Stefanie! You really do!